June 30- First Martyrs of the Church of Rome - Optional Memorial - My Catholic Life! Wave and wave of huge British and American bombers, pregnant with ordnance, opened their bays over Dresden, Germany on February 13 & 14, 1945. Fire joined fire until the city itself was a raging, screaming, bonfire. A tornado of flames hungered for oxygen, sucked all air from the atmosphere, and suffocated to death anyone nearby. The center of Dresden melted, and everyone in it. Only some stone walls remained erect. Human skeletons were mixed in the rubble of a skeletal city. In the old town of Dresden today, a modest memorial marks the location where an unknown number of civilians’ remains were cremated shortly after the fire. It’s easy to walk by without noticing it. Any number of countries have similar memorials marking the mass graves, known and unknown, of the victims of plane crashes, war atrocities, or natural disasters. Many countries also have a memorial to an unknown soldier. That unknown fighter represents all those drowned at sea, lost in the jungle canopy, eviscerated by enemy fire, or simply never recovered, for a thousand reasons, in the heat and sweat of battle. On civic feast days, presidents, governors, and mayors lay wreaths and flowers at the grave of the unknown. A nation’s official remembering – in stone, statue, speech, or ceremony – preserves the past. It seals past heroism for the present and the future. A nation’s common memory is preserved by its government, which guards against national forgetting through official acts of national remembering. The Church’s liturgical calendar is a continual, public, remembering of saints, feasts, and theology, by mankind’s most ancient source, and carrier, of institutional memory – the Catholic Church. Today’s feast day did not exist prior to the liturgical reforms of the Second Vatican Council. Instead, the sanctoral calendar was crowded with various feast days to particular martyrs from this early Roman persecution. Apart from their centuries on the calendar, however, little else supported these particular martyrs’ existence. Today’s feast, then, is a liturgical form of the ceremony held at the military tomb of the unknown soldier, and the memories shared at a memorial for a mass grave. This feast commemorates those unknown, and unnamed, men and women who were cruelly tortured and executed in the city of Rome in 64 A.D. But instead of citizens meeting before a marble structure in a park to sing a patriotic hymn and to witness an official lay a wreath, we do what Christians do. We meet as the faithful in a Church, around an altar, to participate in the sacrifice of the Mass celebrated by the priest, to remember our remote ancestors in the faith who died so that the true faith would not. 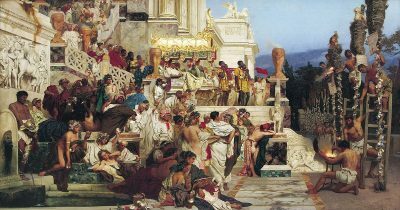 A deranged emperor named The Black (Nero) reacted to a dubious fire which consumed large sections of Rome in 64 A.D. by blaming and executing Christians. A vivid description of the persecution survives from a Roman historian named Tacitus, who was a boy at the time. Some Christians were sewn into the skins of animals to be attacked and eaten by other beasts. Some were slathered with wax, tied to posts, and then burned alive, to illuminate Nero’s garden parties as human candles. Others were crucified. Nero’s evil displayed a high level of refinement. These Christians we remember in the same fashion they themselves would have commemorated the Lord’s own death – by prayer and sacrifice. We are separated in time but united, in faith, by so much more. Anonymous first martyrs of Rome, your blood is still fresh, and your sufferings still alive, in the body of Christ you belonged to through baptism. The baptized of today invoke your powerful intercession to help them be as courageous as you in all things.